Graduated from University of Rhode Island in 1994 with a degree in pre–veterinary science. She has been with SBVC since 1997 ...yes, you heard that correctly! She is definitely considered to be the old timer on the block! She lives with her husband Dave and their 6 yr old son, Eli. In her free time Sharon is an avid runner and will go for miles. Their menagerie of animals includes 3 dogs - Gracie,Georgia and Pete. 2 cats – Ducky and Birdie. They also have 3 tortoises, affectionately named Sprinkles,Sprite and Sprout! 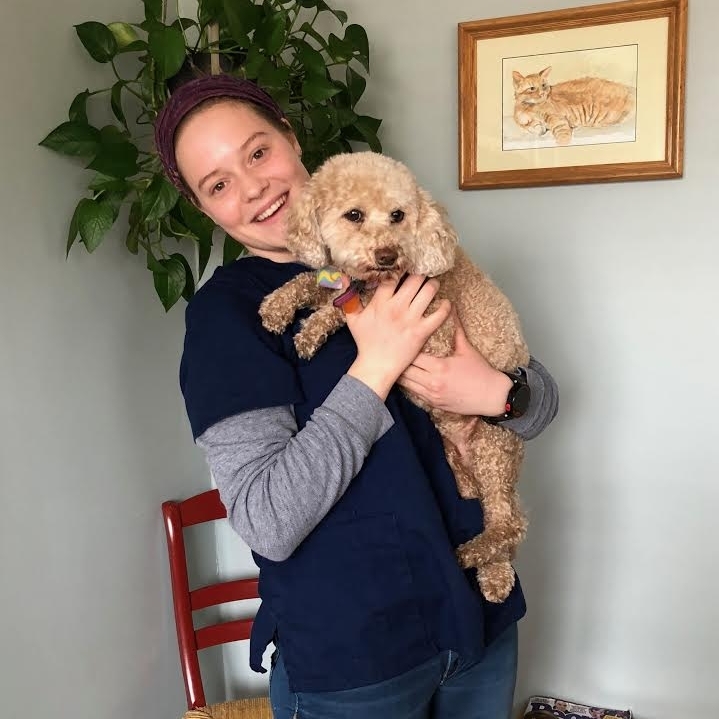 Talia is a licensed veterinary technician.She earned her degree from New England Institute of Technology in March 2014. She started in September 2013 as an intern and has been with us ever since. Not only is Talia an excellant licensed vet tech but she also has an eye for decorating - Halloween being her favorite!! Talia is the proud owner of Linus the cat,Ron Burgundy the Havanese and Huck...her lab mix! Jared is a student at the University of Rhode Island majoring in pre veterinary science and computer science. He has been with us since 2015. He has a passion for animals and computers and plans to go into bio-technology. Jared's favorite interests are in diagnostic testing, 3D-imaging and 3D-printing. He loves his music and loves to exercise. His family dog is named Eddy and his cat Bruce - a chocolate lab rescue from MS and a rescue cat. Lesley is a University of Rhode Island Graduate with degrees in both animal science and wildlife/conservation. She began with us in 2011 and has been with us on and off ever since. Lesley is the proud mother of Ryker the Alaskan Malamute. She has a passion for avian ecology and plans on pursuing graduate school. In her free time she enjoys backpacking, yoga, and spending time outdoors. Julia is a student at the University of Rhode Island. She is studying pre-veterinary science. She has two axolotls named Apa and Momo. During her Summer breaks she lifeguards at Charlestown Beach. She also is an avid runner and swimmer! Our pretty kitty Sophie came to us several years ago as a wee little baby only a couple of days old. She was hand raised by one of our technicians. When she was 8 weeks old she moved into the clinic where she was then raised by our clinic cat Whiskers who taught her all she needed to know about being a cat. He passed down several lessons to her such as, "be as pushy and annoying as possible and the human will eventually give in and give you some of their food". Sophie is a very refined, sassy, sophisticated feline. She spends most of her time sleeping in the cat room on her thrown. Some of her favorite hobbies include playing with bottle caps and hunting the occasional office fly.